The mandatory Online KHSAA Rules Clinic for the sport of Swimming & Diving is available beginning today, October 1. The clinic is required of all officials as well as all coaches, varsity, junior varsity and freshman, and whether or not the coach receives pay. For officials, login to the officials’ subdomain at https://officials.khsaa.org/. October 1 to December 31 (Coaches) – the Swimming & Diving Clinic will be online only and may be viewed at no charge during this period. January 1 to January 20 (Coaches) – the Swimming & Diving Clinic will be online only and may be viewed for the makeup fee ($100) during this period. January 21 to February 3 (Coaches) – the Swimming & Diving Clinic will be online only and may be viewed for the makeup fee ($200) per the Bylaw 27 schedule during this period. After this time, postseason penalties per Bylaw 27 will apply. Diving Coaches are also required to complete the free online NFHS Course “Coaching Diving” at www.nfhslearn.com. October 1 to December 30 (Officials) – the Swimming & Diving Clinic will be online only and may be viewed at no charge during this period. December 31 to January 19 (Officials) – the Swimming & Diving Clinic will be online only and may be viewed for the makeup fee ($30) during this period. January 20 to January 26 (Officials) – the Swimming & Diving Clinic will be online only and may be viewed for the makeup fee ($60) per the Bylaw 27 schedule during this period. After this time, postseason penalties per Bylaw 27 will apply. 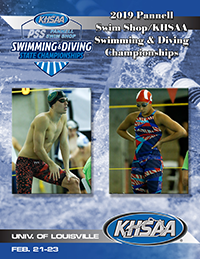 Click Here to Follow the KHSAA State Swimming and Diving Championships!